TNM-FH medium is fully supplemented Grace's medium including trace metals, lactalbumin hydrolysate, yeastolate, and 10% heat inactivated fetal bovine serum. * In addition, 50 µg/ml gentamycin is pre-added to the medium to ensure sterility. This medium is ideally suited for growth, infection, and protein expression of insect cell lines. 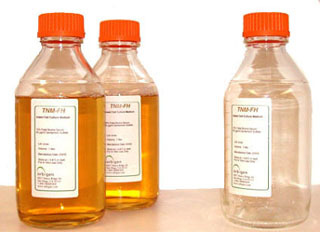 The TNM-FH medium may be used for suspension or monolayer cultures. 1 liter of 1X sterile medium. Store at +2°C to +8°C, dark. The TNM-FH Insect Culture Medium is stable for 2 years if stored properly.